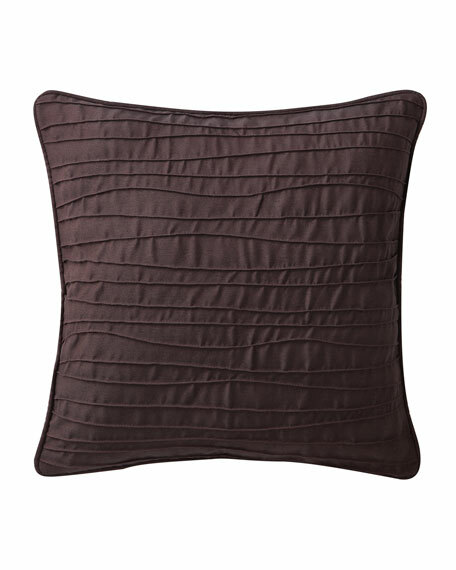 Highline Gabriella Decorative Pillow, 18"Sq. Decorative pillow with an intricate pintuck pattern and piping detail. Decorative pillow with ruffle trim around edges. Made with recycled fabrics by a US company. Down alternative filler included. Cotton recycled fabric. 14" x 24". Spot clean. Made in the USA of imported materials. EXCLUSIVELY AT NEIMAN MARCUS Handcrafted pillow. Feather fill included. Polyester/cotton/viscose/linen. Dry clean. 20"Sq. Made in the USA of imported materials. EXCLUSIVELY AT NEIMAN MARCUS Decorative pillow. Polyester/cotton. Goose feather insert. 20"Sq. Dry clean. Made in the USA of imported materials.